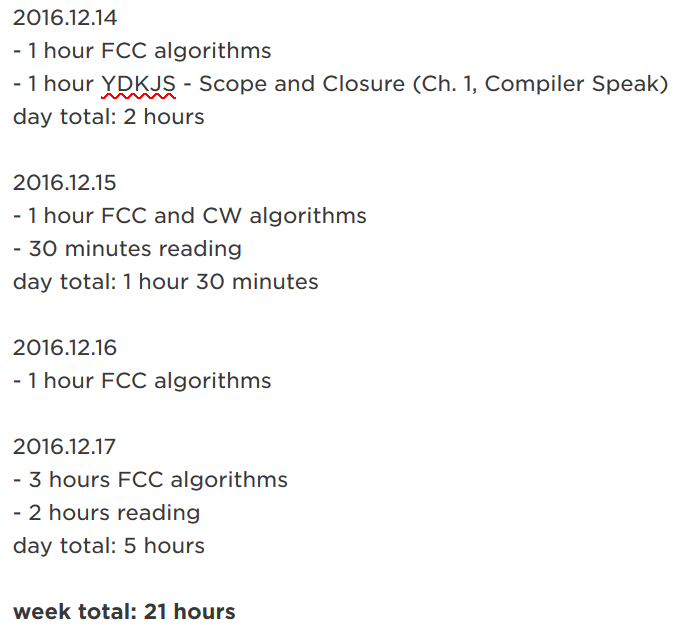 How do you keep track of your hours learning to code? I want to know what tools (apps, spreadsheets, github, etc.) people use to keep track while learning to code. Do you track your learning hourly, daily, weekly, monthly? Do you track topics as you learn? Thank you in advance for your comments and happy coding!!! wow they got an app for that too ? It’s a text editor plug in. I installed it once and then I never have to do anything else to track my time - it’s automatic! Thanks. I see it works on Brackets. Since no one’s paying me, I have absolutely no need or desire to track my time. Hey Jackson, how have you found this useful? What insights have you come across and what adjustments have you made because of it? I have a Task Timer program I use to keep track of billable hours to different clients for different projects. But I don’t use that for tracking self-learning time. I mean, what for? Tracking that information won’t make me learn faster or what not. Plus, saying I spent 2 hrs learning vs. 0.5hrs learning something doesn’t mean I know 4x as much. No correlation between quality and quantity of what I learned in 0.5hrs or 2hours. I track my learning daily and sum up my hours every week. Before every week I set a goal of how many hours I want to code in a week. It’s a great way to hold myself accountable. Even if I don’t get that much done in a week I won’t be improving if I’m not spending the time coding. I just use Evernote. Here’s a sample. I don’t use it to track study time, but I’ve used Toggl for freelance work and like it. When I finish a project it tells me how long I worked on it and specifically how long I spent in each language. For example, I saw that my React Leaderboard about 6 hours, if I recall correctly, and that I spent as much time on the React logic as I did on the styling. This helps me have a better sense of estimating how long tasks will take me. I keep a journal where I write down summaries of things I’ve learnt, explain concepts I’m not sure about, and plan out projects and learning schedules. I find this a lot more helpful than knowing the number of hours spent working. I use Trello with Pomello to track the number of 25mins block I study and work on stuff related to development. At the same time I write a log for 100DaysOfCode. If anyone here is into Pomodoro Clock, you may fine chrome extension (Marinara: Pomodoro) or chrome app (Cherry Tomato) helpful. It’s a free time tracking app (mobile, web, chrome plugin). but also how many hours I was learning React. 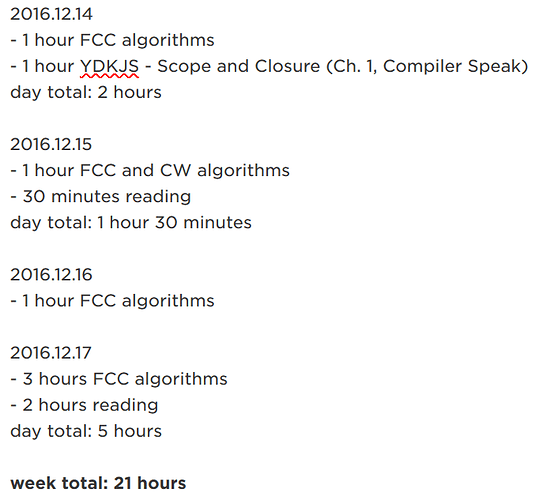 Regarding learning to code, I don’t track my time. I track my progress against a set of concrete, prioritized, micro-goals that I suspect will lead to the accomplishment of my main goal. Time to completion is not important unless my employer, or the market, is signaling there is a deadline to accomplish something to stay alive as a frontend developer. I do plan my time spent doing everything else (sports, housework, reading, events) to make sure that I’m regularly setting aside time to learn software development. I would track my working time if I were a freelancer. For learning to code, it doesn’t make sense for me to track my time reading vs. coding vs. doing tutorials. Instead, I test myself by regularly trying to build things that require me to use what I’m teaching myself. Of course, the ultimate test is getting a real ticket from a paying client and getting it done with as little handholding as possible. That’s getting tracked by Jira, my colleagues, and me. Finally, in my opinion, the metrics those plugins reports are vanity metrics by themselves. If you’re going to track something, make sure it’s worth tracking by making sure it’s closely aligned with some valuable outcome.